The pro se appellate handbook is intended to assist individuals who are representing themselves, also known as pro se litigants, to successfully navigate the appellate process. 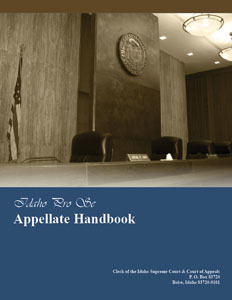 You should find this handbook helpful in preparing and filing the documents needed to proceed with your appeal, but it is not designated to be a complete guide to practice and procedure in Idaho's appellate court system. This handbook is not legal advice, and cannot be used as a legal authority. Navigate all the Pro Se Appellate tabs to find answers to frequently asked questions, deadlines, fees, etc. or download the complete handbook below.